Researchers at Sports Center and Nutrition School of Federal University of Ouro Preto (UFOP) have demonstrated the benefits of physical exercise in malnourished animals. It was verified that malnourishment worsen liver health indicators, corroborating previous studies (KUMARI, et al., 1993), affects oxidative stress markers and generates weight loss. Physical exercise improved these indicators and generated weight gain, thus reversing the biggest feature of malnutrition. Other physical exercise benefits for malnourished animals had already been reported (GALDINO, et al., 2000). The research was conducted at the laboratories of UFOP (Ouro Preto, MG) and was published at Revista de Nutrição (vol. 31, no. 5) under the title “Physical exercise improves body weight gain and liver function in malnourished rats without disturbing the redox balance”. a) Can humans affected with diseases that cause malnutrition be able to perform physical exercises without harming their health even more? What are the benefits of exercise for elderly affected by malnutrition? b) Do running and sweating games really protect malnourished children from malnutrition harms? d) What are the other benefits exercise can bring to malnourished organisms? How would the recovery from the early malnutrition be? At this research, thirty-two rats were equally divided into Sedentary Control, Trained Control, Sedentary Malnourished and Trained Malnourished groups. The training protocol consisted in swimming continuously for 30 minutes, 5 days for week, for 8 weeks. Figure 1. Growth of trained and untrained control and malnourished rats. 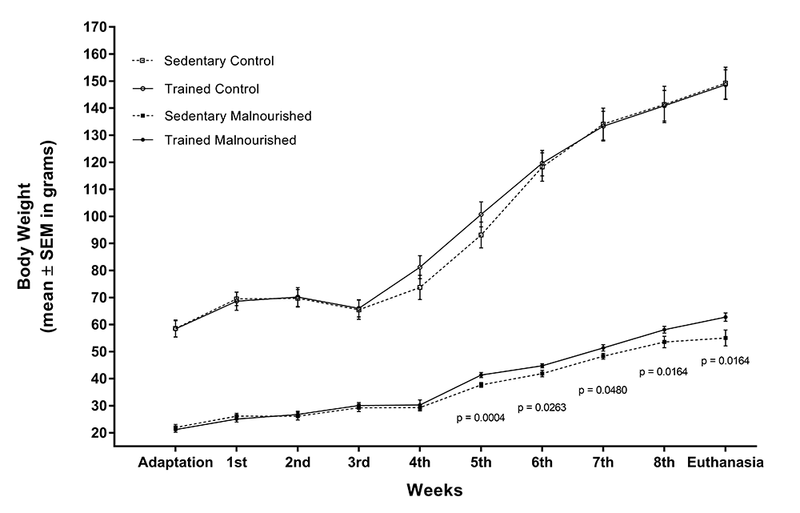 After the fifth week, trained malnourished animals have greater body weight than sedentary malnourished animals (p-value in the graphic). No differences between sedentary control and trained control animals were observed. Early malnutrition was achieved by reducing the total amount of protein offered in the animals’ diet. Thus, from the moment of birth, the animals already received less amounts of protein than their needs, and consequently showed an impaired growth, as shown by the body weight data of malnourished animals (image). In this experiment, malnourished adult animals did not reach the weight of young animals from the control group. Oxidative stress is another topic that has been attracting the researchers’ interest for some time, but there are still many knowledge gaps that need to be fulfilled, which justifies the present study. Thus, oxidative stress was investigated in a malnutrition context, which worsens redox balance, associated with physical exercise that, if performed in a light to moderate manner, may improve this balance. This research was approved by the Ethics Committee for the use of Laboratory Animals of UFOP and accomplished with resources from Fundação de Amparo à Pesquisa do Estado de Minas Gerais (FAPEMIG) from Conselho Nacional de Desenvolvimento Científico e Tecnológico (CNPq) and from Pró-Reitoria de Pesquisa e Pós-Graduação (PROPP) da Universidade Federal de Ouro Preto (Edital PROPP 07/2018). Do you know excess energy intake by western diet may lead to inflammation and even apoptosis?